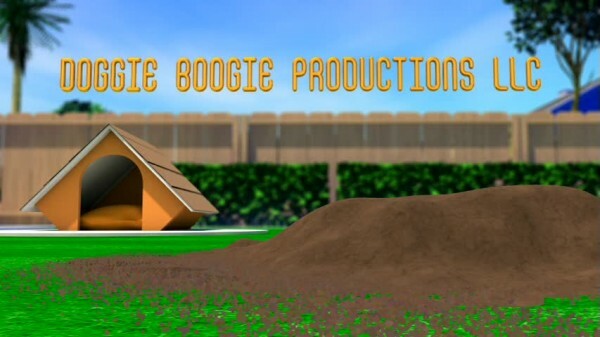 Doggie B (Or Doggie Boogie, the title I first heard of it under) is a unique film experience that is a highlight of independent film. Doggie B is the result of the creative vision of Romanus Wolter, and exhibits both the positive and negative aspects of a singular force driven independent feature. While I enjoyed Doggie B immensely, it’s ultimate place will be a cult film that retains a sizable following, but that doesn’t appeal to everyone. Don’t look at the dirty doggie dancing! Someone get Doggie Patrick Swayze off the floor! 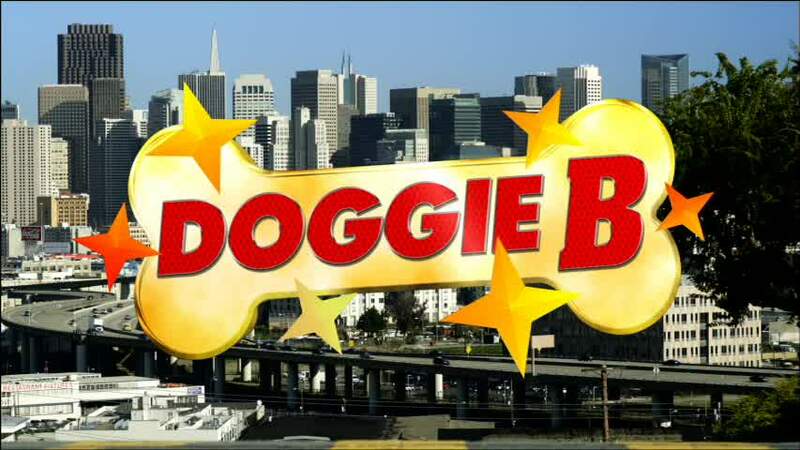 Doggie B is Bay Area weird, and I can say that having lived in the region for over a decade. I’ve walked the same streets as the dogs and humans in Doggie B. I’ve encountered people who spend tons of money on Eastern medicinal practices for their animals. Even with that, the world of Doggie B is beyond bizarre. 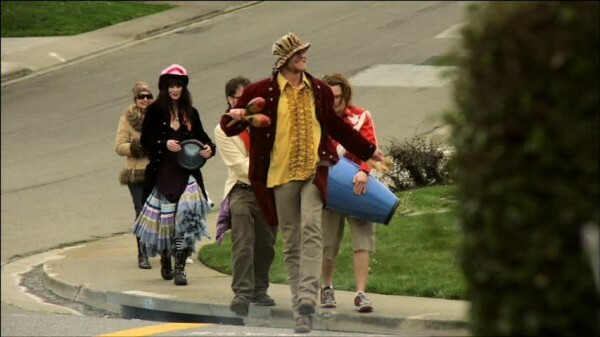 At one point a chase is interrupted by a random bongo parade. Several scenes during the montages and competitions are designed to showcase all the entertainers who are friends of the director and crew, and feature all sorts of interesting things going on. It makes San Francisco look more magical and weird than the reality. Doggie B‘s inventive costumes and characters cause it to stand out from much of the bland children’s entertainment involving animals, much of which is an exercise in boredom. Here, actors are eager to dig into their roles and turn them into something special. Gertrude is a cartoon villain come alive, relishing her villainous reputation as her family’s legacy. Her only disappointment is her grandson isn’t a ruthless as her. 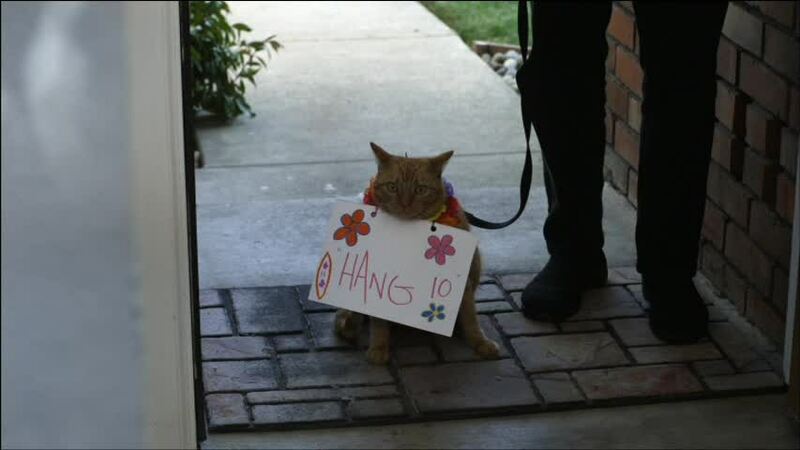 We need a spinoff movie about Hang 10 Cat! 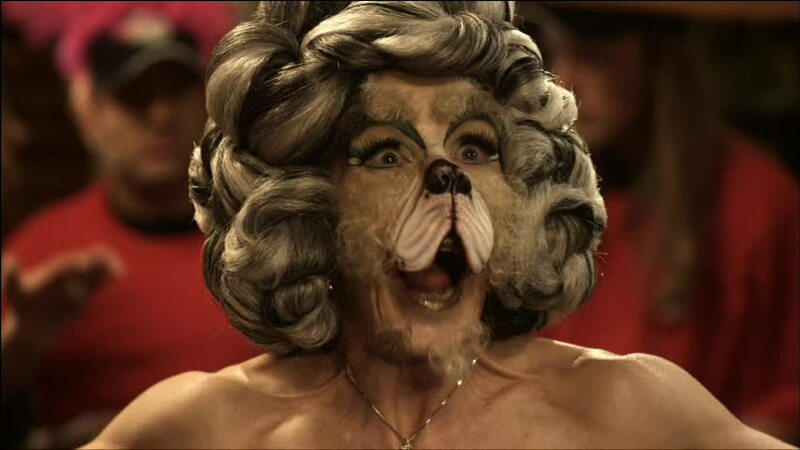 The world of competitive dog dancing (an actual world, before Doggie B the best known representation was an episode of King of the Hill) is the setting for a tale of redemption and finding your place in the world. Doggie B begins as the rivalry between Peter Wolfe and Gertrude Spinner is about to hit another stage. Peter is desperate to defeat Gertrude, who has reigned supreme for a decade, and has his dog perform a dangerous stunt to disastrous results. Cassie Barbizon (Jesse Draper) – Owner of Pijo and future law student, despite not being interested in law. But Pijo’s fainting spells and Uncle Peter’s funk lead her into a world of dog meditation and dog dancing championships that ends up saving the day. 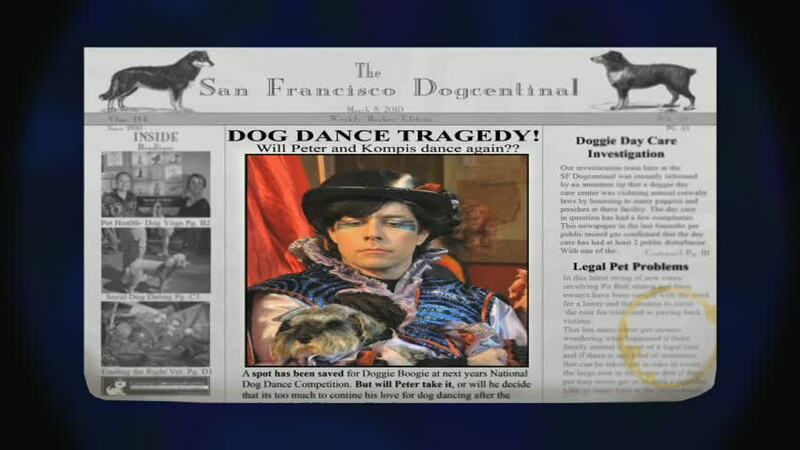 Peter Wolfe (Scott Cox) – Famous dog dancing competitor who constantly comes in second place to his rival, Gertrude Spinner. His dog Kompis is injured in competition doing a tricky move, and Peter lapses into a funk that threatens his business unless his niece Cassie can help. Gertrude Spinner (Bettina Devin) – Multiple-time dog dancing champion along with her faithful canine pal Chaos, Gertrude Spinner will do whatever it takes to remain on top. Even cheat! Her family owns the secret Dog Dance Bible. She has the desire to take over Peter’s studio just to shut it down. Is a recipient of ironic punishment. 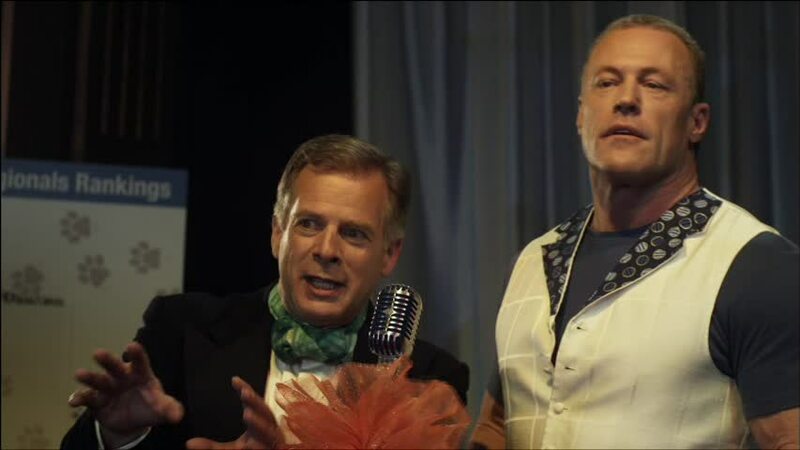 Roman Spinner (Patrick Alan Davis) – Black sheep grandson of Gertrude Spinner who doesn’t have what it takes to hold up to the family legacy of dog dancing champions. Except maybe he does, he just doesn’t do it the traditional family legacy way. Takes a shine to Cassie Barbizon. Karen Barbizon (Barbara Tintori) – Cassie’s mom who is forcing her into taking up the family legacy of female lawyers. Also agrees to watch Pijo and promptly loses track of the dog, thus spends much of the film trying to find Pijo. Pijo (Pijo) – A Bichon that uses the power of fainting spells and doggie yoga to speak with owner Cassie Barbizon so Cassie will find her way in life and save Peter’s dog dancing studio. Rachelle (Erica Gerard) – An employee of Shangrrrla who helps recruit Cassie into joining the team. 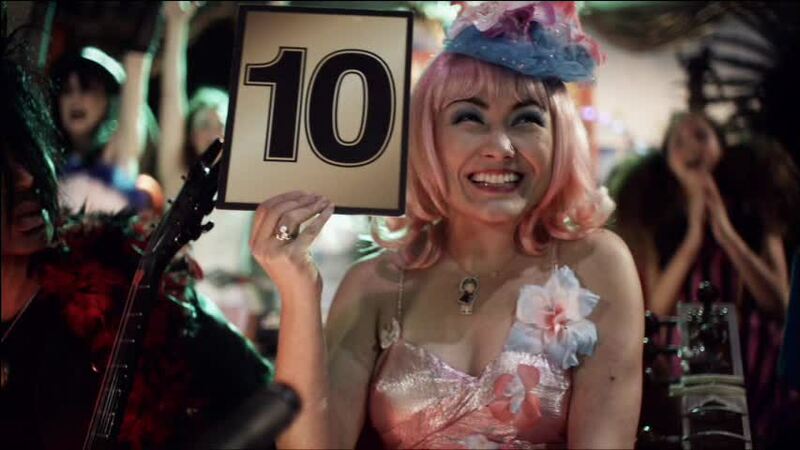 Dottie (Jane Wiedlin) – Owner of Shangrrrla and obsessive Peter Wolfe fan. Jane Wiedlin is a member of the Go-Gos, and also the singing telegram girl from Clue and had a bit part in Star Trek IV: The Voyage Home. Defeated on and off the dance floor, Peter becomes mired in a funk, and his personal and professional life suffers to the point where he is on the verge of losing his home/dog dance studio. 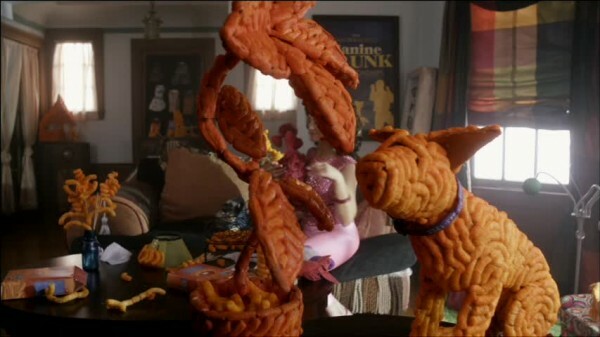 His obsession is for the health of his dog (revealed to be perfectly healthy) and an obsession with Pumpkin Puffs – puffy Cheetos that he eats constantly and many of the background props are constructed out of. The excuse is orange is a healing color. Meanwhile, his niece Cassie is about to head off to college, where her attorney mother is forcing her to follow in the family footsteps despite her wishes to the contrary. 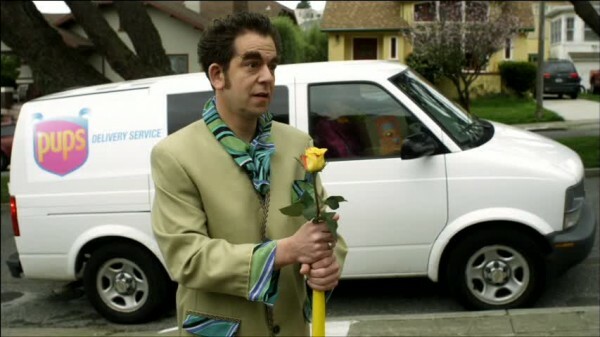 Cassie’s dog Pijo suffers from spells of fainting paralysis, and the assistant veterinarian gives advice on a new age doggy retreat called Shangrrrla. I have on of these installed in my bathroom! Shangrrrla is an amazing place filled with New Age dog puns and every yoga store stereotype you can cram in. I’ve seen enough of these new age shops to recognize they did a good job of dressing it up to look authentic, complete with a ton of dog-themed wall decorations. Some seem created for the film, others I’m not sure about. The place is essentially run by Dottie, while employee Rachelle also joins her in being a fan of Peter Wolfe, as there is a shrine dedicated to him at Shangrrrla. The meditation sessions for doga – doggie yoga – are run by an instructor who knows more about dog mysticism than anyone on the planet. After the session, Pijo “communicates” with Cassie by bringing her information about Peter’s impending foreclosure and the huge prize money at a dance competition. The only logical next step is to train Pijo to compete. Which is over Peter’s initial objections but he makes due quickly. Add to the mix Gertrude sending her nephew Roman in to spy on Peter, but he instead becomes enamored with Cassie. Can Cassie and Pijo take the crown from Gertrude? Will Peter get out of his funk and get funky? Best zombie movie in 10 years. Hands down. Doggie B gives support to tearing down birthright legacies, Gertrude’s family history of winning is based more on her relatives’ hard work in cracking the secrets than her own skills. Peter crashes against this wall again and again, unable to defeat insider legacy knowledge until the realization that improvising and risk taking are essential, as is making sure your opponent doesn’t cheat. Even Cassie chimes in on the legacy aspect, at one point admonishing the judges for scoring more harshly on contestants who are new to the scene. The judges prove their impartiality by promptly kicking her from the tournament (aka they prove her point!) Cassie herself is avoiding her own family’s legacy of female lawyers, wanting to find her own path in life. The cast is an amazing blend of eclectic character actors that seem right at home in the Bay Area. The only objection is the almost complete lack of Asians, as anyone who has spent 10 seconds in San Francisco knows that half the cast should be Chinese. Trust me, there are tons of Asians with tiny dogs who would be down for dancing. There is a lot of local talent and musicians filling in roles, even someone like me who doesn’t pay as much attention to the local music scene as I should recognizes a few. Remember that episode where she battled Bugs Bunny? 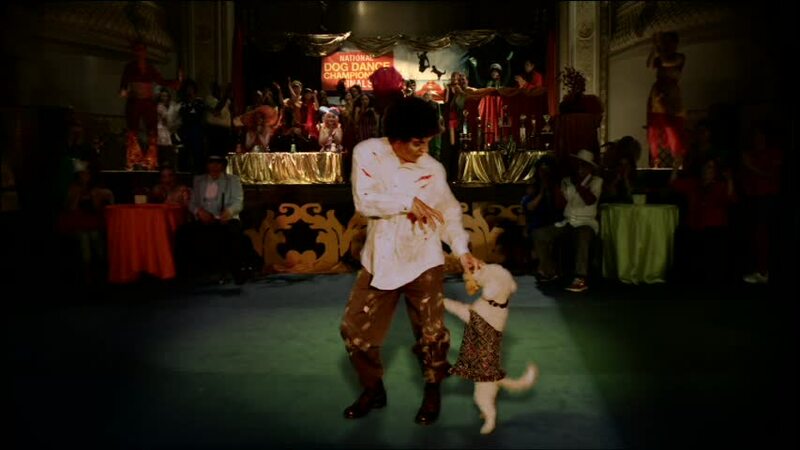 Doggie B‘s biggest flaw is there isn’t enough of the dog dancing. The plot gets sidelined with the whole healing Pijo via Shangrrrla, when a tour of doggy dancing events where rivalries are developed would have followed a more traditional arc. But this isn’t a traditional film, this is a film that bucks the tradition and blazes its own path. So it’s not a surprise that the narrative goes out of left field. Cassie’s own journey doesn’t follow what you expect, but this is a strength. Doggie B is a family friendly romp through the world of John Waters. It’s filmmaking that breaks the rules and cares not, because it’s making its own rules. That even ties in to Peter’s revelation at the end of the film, when he begins to encourage his students to improvise and have fun. In a world where tentpole franchises are mapped out a decade in advance, where four quadrant films bore audiences to tears while employing thousands of CGI technicians to create expensive but emotionally empty art, films like Doggie B are desperately needed now more than ever. Hey, you can’t rate the movie, that’s my job! 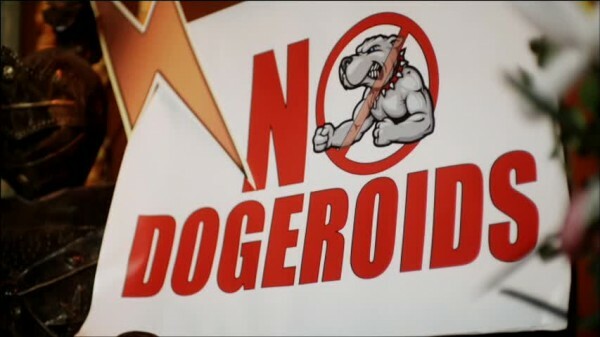 This is why Arnold Schwarzenegger was banned from dog dancing! Slow news week grips nation! You could make millions on Ebay with this stuff! Let’s get in the Mystery Machine and solve this puzzle! The Bay Area: You can’t go three blocks without a random bongo parade blocking traffic! 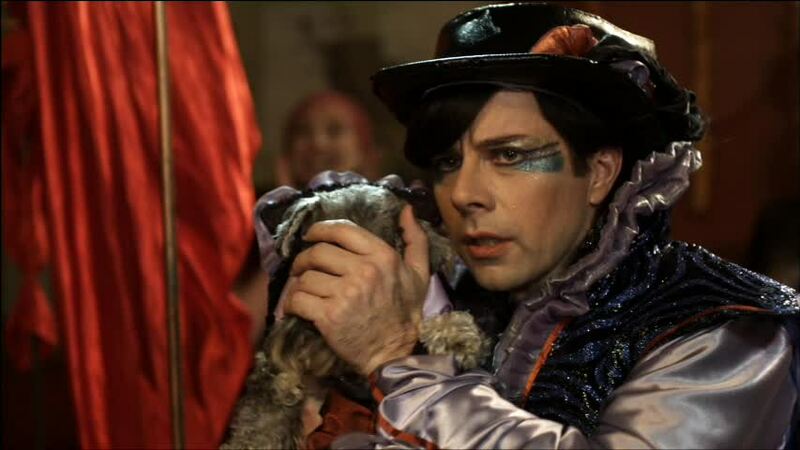 If I don’t take Mr. Snuffles doggie dancing, he makes me kill people! Hey, all this Peter Wolfe merchandise is bootleg! Both punishment and wish fulfillment! Instead of dog dancing I’d like to do my impression of a singing rabbit! 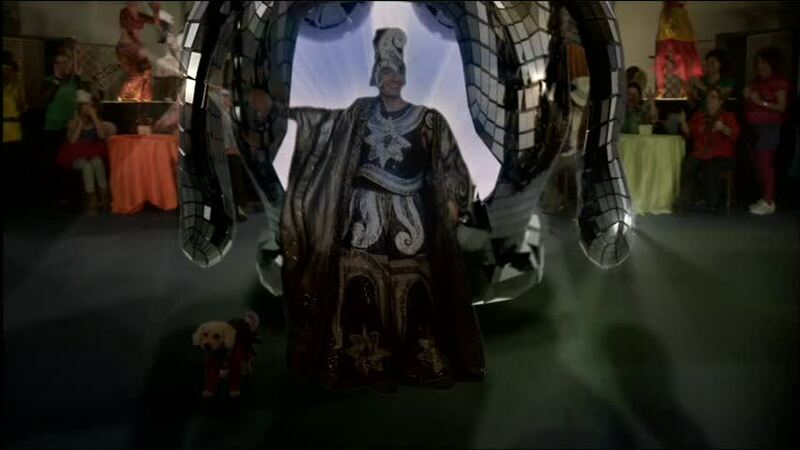 Live from the Planet Neptune, God Emperor Karang and his Enforcer Dog Balthazar!